To make your mark on the future, it helps to take stock of where you’ve been. 2017 promises to be an exciting year for DC and its fans, but before we celebrate the new year, we thought we’d look back on 2016 and consider some of the places we’ve been. DC made some bold choices in the worlds of comics, film and TV, and many of them set our course for the months and years ahead. The past year was full of memorable moments, but some of these moments held real significance. Some of them really mattered. So as we do every year at this time, we thought we’d discuss a few of them. These are DCComics.com’s “Ten Moments that Mattered” for 2016. If you were a fan of Batman v Superman: Dawn of Justice and Suicide Squad, chances are you were also a fan of Gal Gadot’s Wonder Woman and Margot Robbie’s Harley Quinn. While there was much that resonated with DC fans in the films (including Ben Affleck’s more jaded take on the Dark Knight in BvS), there was just something about seeing Diana Prince and Dr. Harleen Quinzel captured so charismatically on camera this year. That they’re two of DC’s most popular female characters certainly had something to do with it. That they’d never before appeared in a live action film likely had a lot more. Gadot was something of a surprise when her casting was first announced back in 2013. Not as widely known as Affleck and lacking the familiarity DC fans had with Man of Steel’s Henry Cavill, she was something of a wild card. Those lack of expectations paid off when viewers saw the film, however. While Gadot’s presence in Batman v Superman was fairly small, she commanded attention in every one of her scenes, much to the delight of unsuspecting viewers. This was true particularly during her climactic appearance at the end of the movie. Bolstered by a battle cry of a theme composed by Hans Zimmer and Junkie XL, Gadot’s Wonder Woman elevates the sequence to become the movie’s best. Side by side with Batman and Superman, it’s Wonder Woman who’s the hero that looks most in control of the situation. She seems thrilled at the prospect of facing death, smiling gleefully after getting struck down by Doomsday. Of course, Diana’s confident grin is a far cry from the utterly loony one that Harley Quinn flashes all throughout David Ayer’s Suicide Squad. 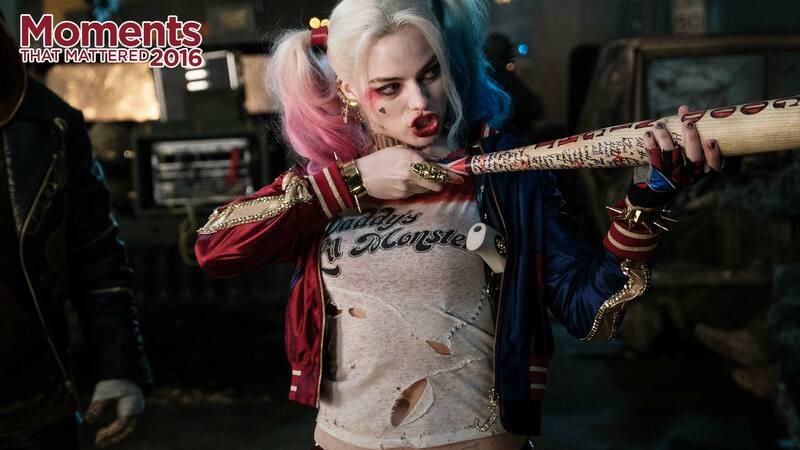 An up-and-comer prior to the film’s release, Robbie as Harley Quinn is a true breakout role for the actress and a watershed moment for the character. Robbie perfectly recreates Harley’s signature blend of humor and violence, peppered all throughout with romantic overtones. It’s a hard balance to maintain, but she pulled it off and managed to capture the attention of filmgoers worldwide in the process. As a result, Harley’s never been more popular than she is right now. The relaunch of her comic shipped more copies than any other Rebirth title and is one of the best-selling comics of the year. Harley remains a popular cosplay subject, and was the most popular Halloween costume of 2016 (fittingly, Wonder Woman also made the top five). None of this takes anything away from Batman, Superman, the Joker or any of the other characters that Harley and Wonder Woman shared the screen with this year. They continue to be as popular as ever. But Wonder Woman and Harley Quinn’s popularity is growing—a sign of the need and desire for strong, interesting female characters within the super hero genre. Fortunately, there are no shortage of them within the DC Universe. Next year will see Wonder Woman release her first solo film and will also mark Amber Heard’s debut as Mera in Justice League. Will she grab the attention of fans the same way Wonder Woman did this year? If she does, you’d better start on that Halloween costume now. Be sure to check DCComics.com again on Monday for another moment that mattered in 2016.